Here's the truth. I'm not that Green these days. A faint tinge, perhaps, around the edge. 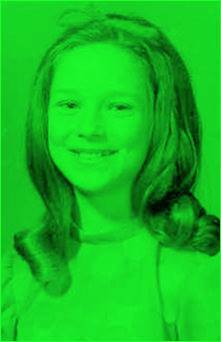 I used to be Green. Here's an old picture of me. See? 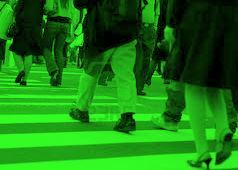 I want to be more Green. And I want to live in a world with lots of Green people. And, so, We Need More Green Picture Books. Like Stuff! Stuff! doesn't look that Green at first glance. More Blue, really. But take another look. It's a lovely story of a mouse that has too much. He finally is convinced to sell off some of his things. The mouse is astounded to find that having less stuff can be refreshing. I loved this book. The children at school that I read it with loved this book. Thank you to Marshall Cavendish for providing me with a copy of this wonderful book. I'll now stay true to the spirit of Greenness by passing this on to my primary school library (as, please note, I do with every suitable children's picture book I receive for review) where it can be passed on again and again and again. 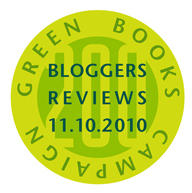 On Wed., Nov. 10, at 1 p.m., 200 bloggers will simultaneously publish reviews of 200 books printed on environmentally-friendly paper. By turning a spotlight on books printed using greener methods, Eco-Libris aims to raise consumer awareness about considering the environment when making book purchases. This year’s participation of both bloggers and books has doubled from the event’s inception last year. The 200 books to be reviewed are in a variety of subjects including cooking, poetry, travel, green living, and history, and come from 56 publishers from the U.S., Canada, Australia, and the U.K. that are participating in the Green Books Campaign. This diversified group of publishers includes both small and large presses who all print books on recycled and/or FSC-certified paper. What a cute book! A few times a year we decide that the kids have too much stuff and they have to pick things to give away. This will be a great book to read with them the next time we do that! I think I could learn a thing or two from that mouse -- I definitely have too much stuff! Glad to hear this one was a hit with the kids you read it to! This sounds adorable! I think it's so important to start teaching kids at a young age about the value of being green. I need to be a little greener too!! This is a cute one! Lately, we have been reading more about being green. My kids and I have learned a few good things we can personlly do. This book looks like a great book to create awareness in the little people in our lives. I also enjoyed taking part in this campaign. Having less stuff appeals to me greatly! I try not to have much now, but somehow it creeps up on me. I love how you pass the books on to the primary library, what a richness for the children! Great review! Sounds perfect for my nephews. Thanks for stopping by my Green Book Review! I have read and reviewed this book in the past and loved it. So glad to see it here on this special day. Thank you! Too cute! I love your green photo. By the way, you are so right about introducing it while kids are young. I still remember a 3rd grade assembly where they instructed us to turn off the water faucet while we brushed our teeth and how much water that saves. I literally think about it every time I brush my teeth. Another impressionable moment: a Weekly Reader showing six-pack rings caught around duck and fish. I don't often buy anything with those rings, but when I do, I cut them into little pieces. I was DEFINITELY affected by that. Bravo for donating yours to the library. I passed mine on to a friend interested in conservation and may instruct him to do the same! I need to be like Stuff!I am in the process of getting rid of things. I have now to retirement age to be baggage free! Very creative introduction! We also have too much stuff. I think one of my resolutions this next year will be to lessen our load. I like the message this book offers children in addition to an eco-friendly printed book. A double win. What a nice lesson for kids to learn early on, especially in this day and age where people tend to collect so many material possessions. Beautifully written, and also like that this book and others are being printed on environmentally friendly paper. oh that looks wonderful! A fun review too! I agree with the mouse, life with less stuff can be so refreshing, I'm decluttering at the moment! Great idea to donate the books you review! Looks like an ADORABLE book (and a goos lesson!). Great review too. That looks like a great book! I wish they would emphasize reusing more than they do.